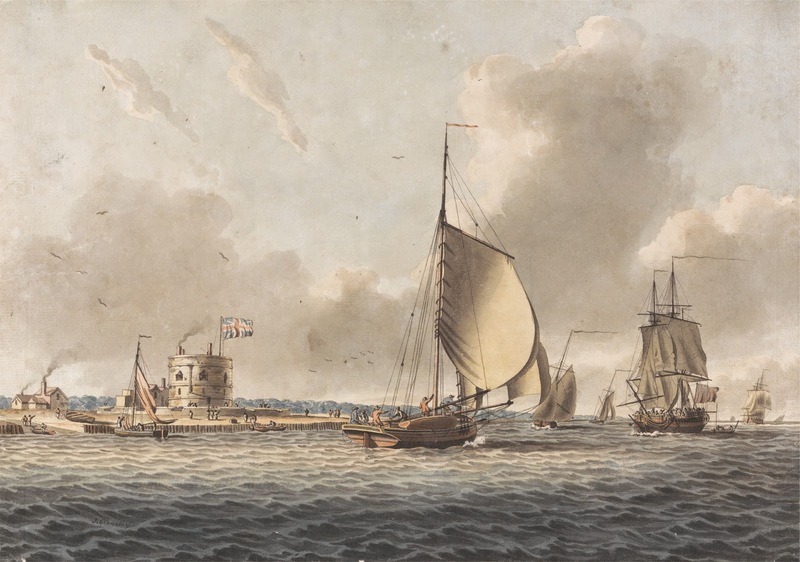 An English Frigate and Other Shipping in the Solent off Calshot Castle, John Cleveley the younger, date unknown, Yale Center for British Art. Built in the days of Henry VII, Calshot Castle has long been home to the armed forces of Britain. Aside from its obvious role in the defense of the waters leading to Southampton, Calshot Castle was manned as recently as the 20th century, during which time it was used as an RAF base. Even by the time this painting was done, Calshot Castle was about two centuries old, but was serviceable enough to remain garrisoned. Lying under the guns of Calshot Castle and the bow of a small frigate, this sloop's crew guide her under a stiff breeze. At the stern, a man in a cocked hat (who may be the master) leans against the rail in his blue coat. Beside him and apparently conversing with him is a tar in a blue jacket with a brown cap. The helmsman at the tiller wears a long brown jacket and a round hat with a wide brim and tall crown. Amidships are three sailors in brown and black caps with short jackets in brown, blue, and white. The tar at the bow appears to be wearing a pair of yellow slops, but the details are too scant to be certain.